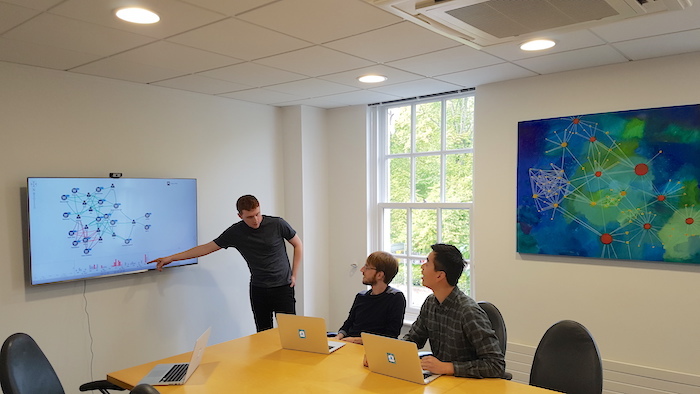 Every year we welcome a group of students and recent graduates to our three-month summer internship at Cambridge Intelligence. 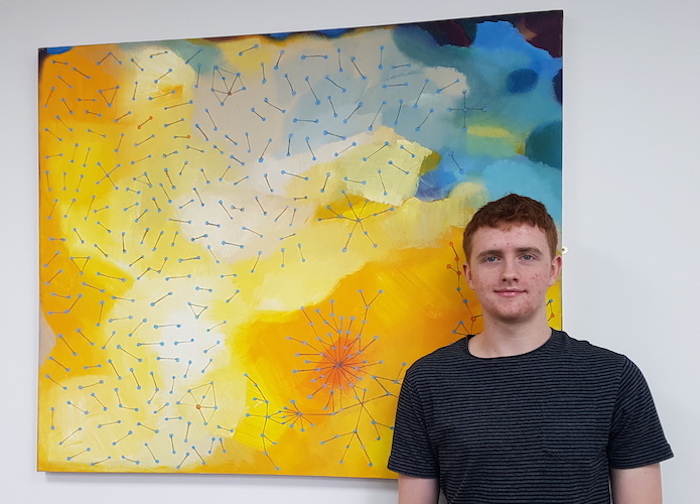 Below, second-year university student, Toby Drane shares his experience. I’m not a fan of taking photos but I made an exception for this blog. I’m studying towards a Computer Science degree at Keele University. Although I’m only about to start my second year, I have ambitions of starting my own software company one day, and want to gain as much work experience as possible by the time I graduate. I like big data and coming up with different solutions to control it, understand it and analyze it. One solution is graph visualization which is what Cambridge Intelligence specializes in with their KeyLines technology. When I discovered what Cambridge Intelligence does I wanted to learn more so applied for the internship. I chose to do my internship at Cambridge Intelligence because I wanted to work directly with someone who started their own company. Joe is very involved in the development of KeyLines and has been a great mentor to me – taking coffees together to chat. I wouldn’t have received the same one-on-one interaction with the CEO at a bigger organization. As an aspiring software developer and start-up founder, I joined the development (or dev) team. The team is small and made up of friendly, helpful people who also happen to be some of the best software developers around. You get to know everybody on a personal level, which is great. You’re not just another face at a huge corporation. The dev floor is peaceful, which is ideal for someone like me who likes getting locked into a project without too many distractions. That said, collaboration is encouraged so we often have brainstorming sessions or do pairing work to share knowledge and come up with creative ideas. Brainstorming with fellow interns – Augustin to my right and Oscar. The dev team works with quick turnaround times – we go from an idea to a feature in two weeks. Although it’s fast-paced, it’s not overbearing. You’re given a project and can get on with your work without being micromanaged. I’ve been a full member of the team since the day I joined. I thought interns would be treated differently or given the unstimulating jobs but that wasn’t the case. I’ve mostly been working in the drawing team. Fundamentally, we implement new visual features for KeyLines and improve rendering performance. The most exciting thing I’ve done is add a feature to the time bar – a component to help users explore connected data as it evolves through time. The new feature, included in the KeyLines 4.7 release, allows users to highlight times or time ranges of interest to make them stand out. It’s especially useful for alerts or periods of unusual activity. Below, it’s been used to highlight credit card fraud. It was thoroughly rewarding seeing the time bar highlights feature evolve from an idea to being deployed into KeyLines and knowing that I had an input. A snapshot of the feature I helped build. Users can now highlight times or time periods in the KeyLines time bar. I’ve heard horror stories of interns working at companies where they aren’t valued and are treated less than everyone else. That’s not the case here. The people are friendly and are eager to help. When we first joined we were taken on an intern welcome lunch (we also go for monthly team lunches) and there’s a social committee that organizes monthly socials which are a great way to get to know your colleagues outside the office. 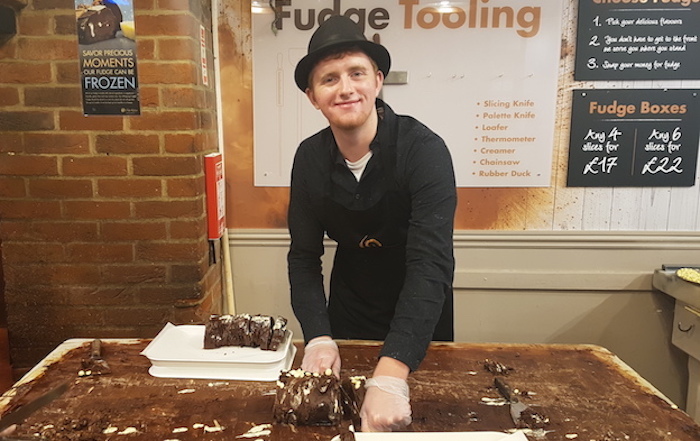 We recently went fudge making, not something I thought I’d experience during my time here. Should I add fudge maker to my CV? Making fudge at our fudge making social. This was my first software job and it’s set me up well. Working with a cutting-edge product, experienced developers, and learning a great deal in a friendly environment has been a wonderful experience. It being a paid internship was the cherry on top. If you’re thinking of applying, do it. You learn so much in three months and the time goes by so quickly. This internship teaches you different things that you can’t learn in class or a textbook. It gives you hands-on experience and gives you a great launchpad for your career. Also, you could leave knowing how to make fudge!